My iPad arrived yesterday, and I am going to spend the next few weeks exploring the ways this device could be used to extend and enhance teaching and learning at DePaul. It is a pretty cool gadget, so I will be having plenty of fun along the way. I am writing this whilst traveling to work on a moderately empty Brown Line El. The iPad's virtual (onscreen) keyboard isn't perfect, but it works fairly well. I'm using Apple's Pages App to compose copy, and the combination of predictive text and native spellchecking is keeping me on the straight and narrow. 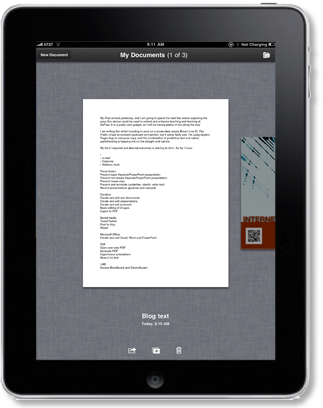 Note: File sharing is possible with iWork Pages, but it gets a little cumbersome. Note: Apples’s Camera Connection Kit seems to allow USB headsets and keyboard to work. Note: iAnnotate PDF seems to work well here. Already I have been distracted by some of the cool ways to consume content on the iPad (I can watch streaming Netflix movies for example), but I am quietly confident that this device can be useful within the work environment. This promises to be a great presentation - Mary knows what she is talking about, and an understanding of copyright is vital when teaching online and hybrid courses. Please RSVP if you wish to attend.